One of the simple and basic principles of GBC is motion. Therefore, it’s important that I spend a couple of lines explaining you how to bring motion to your module. 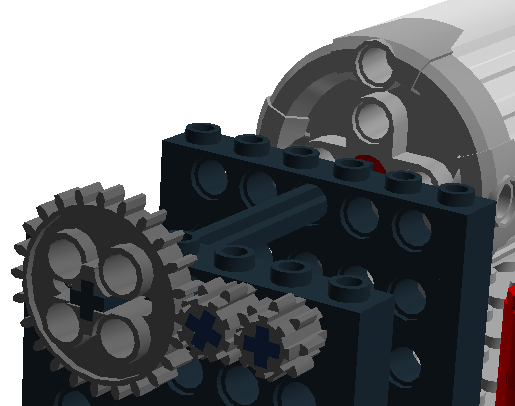 Of course, motion can come from you, manually rotating one of the wheels, giving to the module the bit of rotation it needs to move some of your balls. However, the best way to action your balls at a regular speed remains the usage of Lego Technic engine, which becomes nearly a must-have when dealing with GBC. 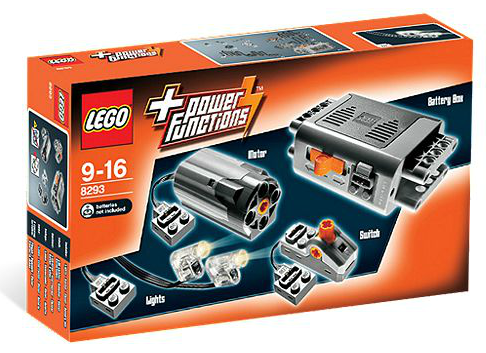 I must confess that when I started with GBC, the last image I had about Lego engine was the old battery pack that was supplying power to my fist Lego train (yes… guess my age!) Outdated, somehow… But it was my pleasure to see that, if some brand new engines and motorized parts have popped up, the basic fundamentals were still intact: A battery pack, powered by standard AA batteries, with a standard 3 positions interrupter (stop, start, reverse), linked to a standalone engine rotating at stable speed. However, one big difference with my childhood engine is without any doubt the power it delivers. As a small experiment, I have tried to plug my old Lego motor to a freshly made GBC module. It was worth the try… to confirm that if you own an old Lego motor (from the 80’s), you’ll have unfortunately to invest if you really want to bring motion to your GBC modules. 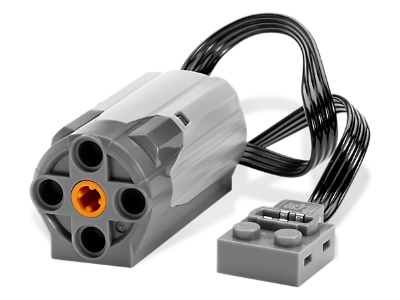 Lego is proposing several kinds of motor, each one having a letter indicating power capabilities, a bit like a T shirt size. This way, the M-motor will deliver you standard power. And the more you go along letters, the more power you’ll get out of the motor. By experience, a standard M-motor will allow you to run most of GBC modules, even a large majority of the masterpieces. However, in case you have complex gearing/wheel structure or if your rotation is spread across numerous zones of your GBC module, going for a L or an XL motor might be required. ➡ Start with a standard M-motor. This is plenty enough for most of your buildings. While experimenting with GBC modules, you’ll quickly discover that the parts velocity can differ from one location within the module to another, even though the motor rotation speed is constant. This is brought by the gearing reduction/gearing up of wheels, one of the basic principles of GBC module “physics”. As you will see, these speed adaption principles are heavily used by GBC module builders to orchestrate the motion speed within various parts of the module. ➡ The first option, and from far most common one, is to play with wheels to increase or decrease the rotation speed delivered out of the motor. Honestly, that is what makes GBC module so fascinating: the fact that a simple motor can steer an all-in-motion module (Ball Factory v2 from Akiyuki is the more impressive illustration of this!). That is what you’ll commonly meet while following building instructions. 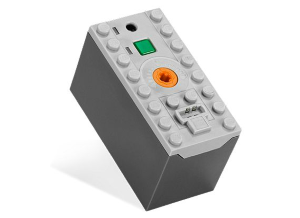 ➡ A second option is to use a Lego Electric Train Speed Regulator 9V (reference 4548). This part will not allow you to have a different velocity in various parts of the module. However, it will allow you to regulate the overall rotation speed that you want to see delivered to your module. You will often see such regulator appearing on the videos showing GBC modules, which proves it’s a must-have. Using intensively your GBC module could be quite power consuming (even though I must say I was positively surprised by the low power consumption of the M-motor, which last quite a while with my initial set of batteries). You might want therefore to find an alternative solution to power your engines. ➡ Use the standard battery-pack powered by standard AA batteries. It’s the cheapest option on the short run, but it might become expensive if you are plugging several motors onto the same battery pack (by the way, yes you can do this: 4 M or 2 XL motors on the same battery pack) or if you are keeping your module constantly in motion (for an exhibition for instance). ➡ Last but not least (I’ve kept the best option for the end), use the “4548 – Lego Electric Train Speed Regulator 9V” I’ve mentioned in the previous chapter. 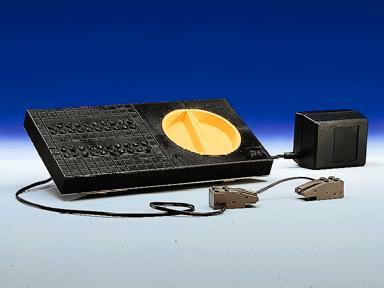 This option offers you, for a good price, constant power, that you can even modulate. It’s a AA battery free option. If you do not forget to also buy the associated adaptor, you have here a must-have option (for home or exhibitions)! If you choose this option, do not forget to buy a “8886 Extension Wire (20 cm)” or a “8871 Power Functions Extension Wire (50 cm)” as these two wires are the only ones which can plug on the Train Speed Regulator 9V. Just starting out. Looking at the electric train controller on ebay which I can get box only from Europe at good value, and the cables you mention are cheap enough to buy. You mention a specialist transformer in the section above for the rechargeable power box, but do you need a specialist transformer for the train controller please? yes, you also need a special transformer for the train controller.